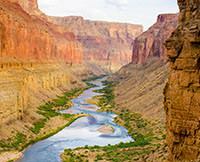 I went in April on the Grand Canyon rafting trip with my son, Tom Jr. I have read all the guest comments from the years before and all I can say is, "Amen." The trip of a lifetime was made possible by the Canyon, J-Rig boat, wonderful boat mates, some great guides and boat captains (Tiffany and Mark on one and Craig and Cash on the other). They were pros and made everyone feel part of the great trip. As a 74 year-old guy, I found that most of the younger ones could keep up with me and vie being on the front of the boat. We went thru the whitewater rapids in great style, including the big one at the end, Lava Falls. I recommend this trip for a life-marking experience.